1. Eligibility: Sprint Picture the Possibilities Sweepstakes (the Sweepstakes) is open only to legal residents of the fifty United States and the District of Columbia who are eighteen years of age or older and are current employed at or a member of an eligible company associated with an individual prize pool (collectively, the Eligible Companies). To enter the Top Companies Drawing, an entrant must be currently employed at a Fortune 1,000 company or in public sector (e.g., healthcare, education, state or local government). To enter the Uber Drawing, an entrant must currently drive for Uber. To enter the Military & Veterans Drawing, an entrant must be an active duty military, reservist, or veteran of the United States Armed Forces or a family member. To enter the AAA Drawing, an entrant must be a current member of AAA on or before March 12, 2019. To enter the CUSG Drawing, an entrant must hold an account at a credit union. To enter the American Airlines Drawing, an entrant must be a current member of the American Airlines AAdvantage program. 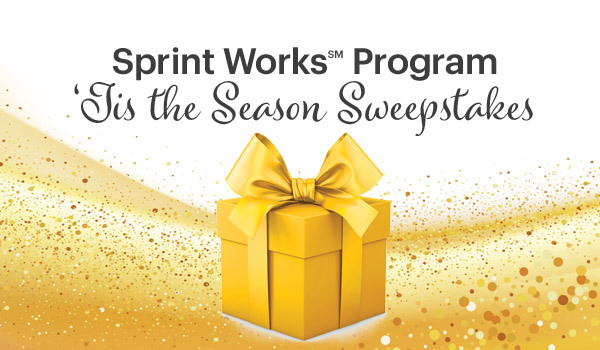 Employees of Sprint Communications Company L.P., or other companies associated with the promotion of the Sweepstakes, as well as the immediate family (spouse, parents, siblings, and children) and household members of each such employee are not eligible. The Sweepstakes is subject to federal, state, and local laws and regulations and is void where prohibited. Void in Puerto Rico and where prohibited. 2. 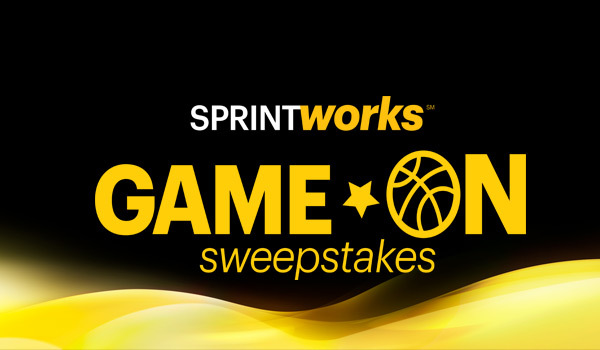 Sponsor: The Sweepstakes is sponsored by Sprint Communications Company L.P. (the Sponsor). 3. Administrator: The Sweepstakes is administered by Prize Logic, LLC (the Administrator). 4. Agreement to Official Rules: Participation in the Sweepstakes constitutes entrant's full and unconditional agreement to and acceptance of these Official Rules and the decisions of the Sponsor, which are final and binding. Winning a prize is contingent upon fulfilling all requirements set forth herein. 6. How to Enter: No Purchase Necessary. During the Promotion Period, an eligible entrant must visit the applicable website associated with his/her employer or membership association. 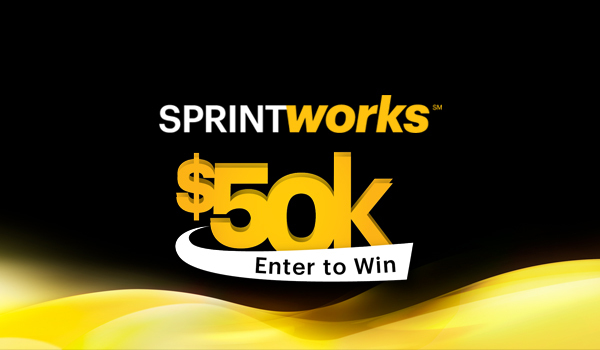 To enter the Top Companies Drawing visit www.sprint.com/picture50K, to enter the Uber Drawing visit www.sprint.com/driveaway50K, to enter the Military & Veterans Drawing visit www.sprint.com/TangoMike, to enter the AAA Drawing visit www.sprint.com/50KforAAA, to enter the CUSG Drawing visit www.sprint.com/50Kgiveaway, and to enter the American Airlines Drawing visit www.sprint.com/flyaway50K (each, and collectively, the Website). Once at the applicable Website the entrant must enter his/her valid e-mail address. If it is the entrant's first time at the Website, the entrant must provide the required registration information including, but not limited to, his/her first and complete last name (no initials), Company/Agency name, date of birth, mobile number, street address (no P.O. Boxes will be allowed), city, state, and ZIP Code. 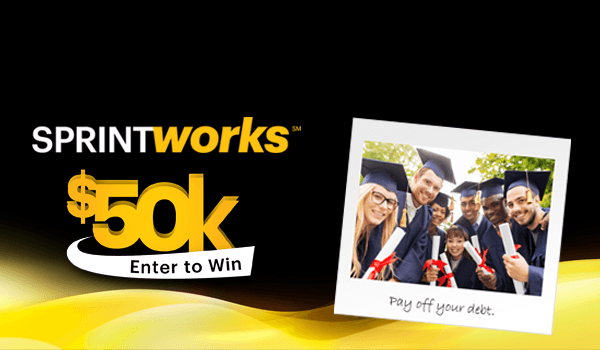 Entrant will earn one Sweepstakes entry into the applicable prize pool for registering. Limit: Limit one (1) entry per entrant per Entry Period during the entire Promotion Period, regardless if he/she meets the eligibility requirements for more than one Eligible Companies drawing. If an entrant attempts to enter more than three (3) times collectively during the entire Promotion Period, all of his/her entries may be disqualified, in Sponsor's sole discretion. In the event that a household enters the Promotion using more than five unique e-mail addresses, all of the entries associated with that household (determined by Sponsor or Administrator in their sole discretion) may be disqualified. 7. Drawings: On or about the next business day after an Entry Period ends, the Sponsor will select the one potential winner in a random drawing of all eligible entries received for the applicable drawing during the Entry Period. The odds of being selected as a potential winner depend on the total number of eligible entries received for the applicable Entry Period. The Sponsor will attempt to notify each potential winner on or about the next business day after the random drawing. If a prize goes unclaimed after three attempts to contact the potential winner the prize will not be awarded. 8. Requirements of Potential Winner: Each potential winner will be required to complete and return  an affidavit of eligibility and liability/publicity release (Affidavit/Release) and  an IRS Form W-9 and furnish his/her social security number that will be used only for the purpose of reporting the Winner’s prize earnings to the Internal Revenue Service, as required by law within five days of being notified. If a potential winner fails to sign and return the required documentation within the required time period, he/she will be disqualified and an alternate entrant may be selected in his/her place in a random drawing of all entries received. A. Top Companies Drawing Prizes (1 per Entry Period, 3 total): Each winner in the Top Companies Drawing will receive a check for $50,000. The ARV of each prize is $50,000. 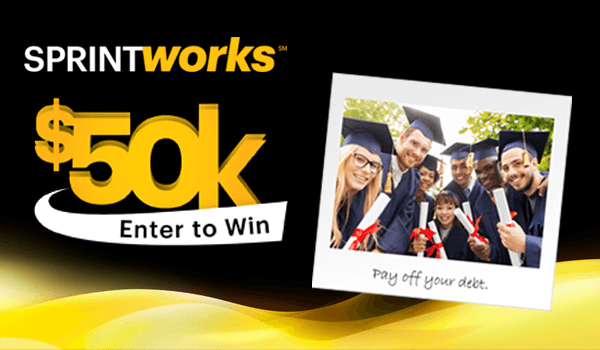 Only three prizes will be available for the Top Companies Drawing in the Sweepstakes – one for each Entry Period. B. Uber Drawing Prizes (1 per Entry Period, 3 total): Each winner in the Uber Drawing will receive a check for $50,000. The ARV of each prize is $50,000. Only three prizes will be available for the Uber Drawing in the Sweepstakes – one for each Entry Period. C. Military & Veterans Drawing Prizes (1 per Entry Period, 3 total): Each winner in the Military & Veterans Drawing will receive a check for $50,000. The ARV of each prize is $50,000. Only three prizes will be available for the Military & Veterans Drawing in the Sweepstakes – one for each Entry Period. D. AAA Drawing Prizes (1 per Entry Period, 3 total): Each winner in the AAA Drawing will receive a check for $50,000. The ARV of each prize is $50,000. Only three prizes will be available for the AAA Drawing in the Sweepstakes – one for each Entry Period. E. CUSG Drawing Prizes (1 per Entry Period, 3 total): Each winner in the CUSG Drawing will receive a check for $50,000. The ARV of each prize is $50,000. Only three prizes will be available for the CUSG Drawing in the Sweepstakes – one for each Entry Period. F. American Airlines Drawing Prizes (1 per Entry Period, 3 total): Each winner in the American Airlines Drawing will receive a check for $50,000. The ARV of each prize is $50,000. Only three prizes will be available for the American Airlines Drawing in the Sweepstakes – one for each Entry Period. H. Odds of Winning/Limit: The odds of winning a prize depend on the total number of eligible Sweepstakes entries received during the applicable Entry Period for the applicable pool. Limit one (1) prize per person/household during the entire Promotion Period. I. General: In no event will more prizes than are stated in these Official Rules be awarded. If, for any reason, more prize notifications are sent (or more claims are received) than the number of prizes offered, as set forth in these Official Rules, Sponsor reserves the right to award the intended number of prizes through a random drawing from among all eligible prize claims received. There is a limit of one Sweepstakes Prize per person/household during the Promotion Period. No prize substitution or exchange will be allowed, except as indicated elsewhere in these Official Rules and except by Sponsor, who reserves the right to substitute a prize of equal or greater value in case of unavailability of a prize. 11. General Conditions: In the event that the operation, security, or administration of the Sweepstakes is impaired in any way for any reason, including, but not limited to fraud, virus, or other technical problem, the Sponsor may, in its sole discretion, either (a) suspend the Sweepstakes to address the impairment and then resume the Sweepstakes in a manner that best conforms to the spirit of these Official Rules or (b) award the prizes at random from among the eligible entries received up to the time of the impairment. The Sponsor reserves the right in its sole discretion to disqualify any individual it finds to be tampering with the entry process or the operation of the Sweepstakes or to be acting in violation of these Official Rules or in an unsportsmanlike or disruptive manner. Any attempt by any person to undermine the legitimate operation of the Sweepstakes may be a violation of criminal and civil law, and, should such an attempt be made, the Sponsor reserves the right to seek damages from any such person to the fullest extent permitted by law. Failure by the Sponsor to enforce any provision of these Official Rules shall not constitute a waiver of that provision. In the event of a dispute as to any online entry, the authorized account holder of the e-mail address used to enter will be deemed to be the participant. The “authorized account holder” is the natural person who is assigned to an e-mail address by an Internet access provider, online service provider, or other organization responsible for assigning e-mail addresses for the domain associated with the submitted e-mail address. 12. Warranties and Consents: By completing and submitting an entry, you: (a) represent and warrant that (i) you have read, and agree to be bound by, these Official Rules, (ii) based on the Official Rules, you are eligible to participate in the Sweepstakes, and (iii) all of the information provided as part of your entry is accurate; (b) consent to the use of your name and/or likeness and your entry by the Sponsor for promotional purposes (whether online, in print or through any other media now known or hereafter developed), without additional compensation or authorization unless prohibited by law; and (c) agree to be bound by the interpretations of these Official Rules by the Sponsor which are final in all matters relating to the Sweepstakes; and (d) acknowledge that this Sweepstakes is in no way sponsored, endorsed, administered by or associated with the Eligible Companies. 13. Release and Limitations of Liability: By participating in the Sweepstakes, entrants agree to release and hold harmless Sponsor, Eligible Companies, their parent companies, officers, directors, employees, and agents (the Released Parties) from and against any claim or cause of action arising out of participation in the Sweepstakes or receipt or use of any prize, including, but not limited to: (a) any technical errors that may prevent an entrant from submitting an entry; (b) unauthorized human intervention in the Sweepstakes; (c) printing errors; (d) lost, late, postage-due, misdirected, or undeliverable mail; (e) errors in the administration of the Sweepstakes or the processing of entries; or (f) injury, death, or damage to persons or property which may be caused, directly or indirectly, in whole or in part, from entrant’s participation in the Sweepstakes or receipt of any prize. Entrant further agrees that in any cause of action, the Released Parties; liability will be limited to the cost of entering and participating in the Sweepstakes, and in no event shall the Released Parties be liable for attorney's fees. Entrant waives the right to claim any damages whatsoever, including, but not limited to, punitive, consequential, direct, or indirect damages. 14. Disputes: Except where prohibited, entrant agrees that any and all disputes, claims and causes of action arising out of, or connected with, the Sweepstakes or any prize awarded shall be resolved individually, without resort to any form of class action, and exclusively by the appropriate court located in the State of Kansas. All issues and questions concerning the construction, validity, interpretation and enforceability of these Official Rules, entrant’s rights and obligations, or the rights and obligations of the Sponsor in connection with the Sweepstakes, shall be governed by, and construed in accordance with, the laws of the State of Kansas, without giving effect to any choice of law or conflict of law rules (whether of the State of Kansas or any other jurisdiction), which would cause the application of the laws of any jurisdiction other than the State of Kansas. 15. 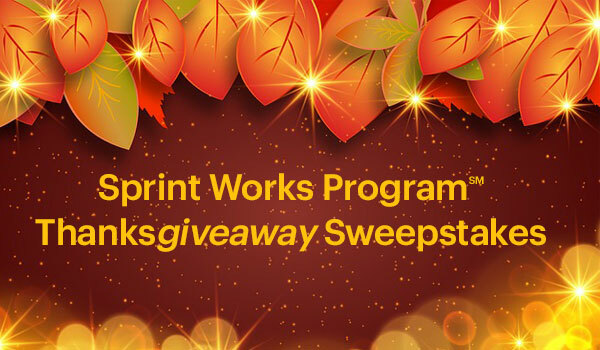 Winners List: To obtain a list of winners, mail a self-addressed, stamped business-sized envelope to: Sprint Works Picture the Possibilities Sweepstakes – Winners List Request, P.O. Box 251328, West Bloomfield, MI 48325. Winners’ List requests must be received by September 12, 2019. 16. THIS SWEEPSTAKES IS VOID WHERE PROHIBITED OR RESTRICTED BY LAW.